..:recycled minds:..: Bolivia has a new President. Cheers to what may come. Bolivia has a new President. Cheers to what may come. 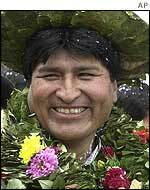 An article from In These Times describes Evo Morales as: "a proudly left-leaning indigenous activist who defends the traditional rights of peasants to grow coca and describes the Free Trade Agreement of the Americas as "'colonization.'" The article goes on to describe the new president's background, and offers an interview with him from November - before he won the election. "The majority of people in this country--people from more than 30 indigenous groups--did not participate in the foundation of Bolivia in 1825. We have to re-found Bolivia in order to end the colonial state, to live united in diversity, to put all our resources under state control, and to make people participate and give them the right to make decisions." "We will ask for the total [forgiveness] of the debt, negotiating with the World Bank and the IMF. We are looking into the possibility of presenting a demand that Bolivia be compensated for genocide and 500 years of oppression and violations of human rights. It would be a historic thing to do, especially for an indigenous government." "If the 19th century belonged to Europe and the 20th century to the United States, the 21st century will belong to America, to Latin America. I have a vision of integration, like the European Union, with a single market and a single currency and with the corporations subordinate to the state." "I am sure that America would be better off without the United States and the IMF controlling all of its resources." And if you want more, check out this ZNet article - writen by Evo Morales! It appears as if change is afoot down in South America. Crazy times may lay ahead for the Bolivian people, but positive change is possible. The voice of the indigenous may now be heard - to a certain degree at least - bringing recognition, respect, and maybe even some power to a people who have long suffered the consequences of the European invasion over 500 years ago. I agree with his comments, especially when he notes that"...America would be better off..." The United States appears fine when contrasted against Canada, Mexico, and South America. It's prosperous against those countries. But we have no culture left, nothing that on a national basis can cause enough concern that it wouldn't be completely forgotten about on a long enough time line. It's already happened. So as the title of this post states, "Cheers to what may come." Hopefully the new Bolivian president will end the struggle for his peoples humanity.